Fourteen Data Rate (FDR) is the latest iteration of Infiniband (IB) to hit the market, and an increasing number of machines are being deployed with it. This uptake of FDR hasn't been without its share of trouble though, and I've heard a fair amount of anecdotes from early adopters lamenting issues with FDR. Through the course of several of these discussions, an interesting question came up to which I have been unable to find an answer: is the move up from QDR to FDR really worth it? The vendors would have you believe that FDR is just better in every way (after all, FDR's 14Gbit peak is bigger than QDR's 10Gbit peak), but I was skeptical. Through a little bit of testing I documented below, it turns out that dual-rail QDR IB can outperform FDR in a variety of aspects and is, at the very least, worth consideration. The performance that can be squeezed out of a dual-rail configuration makes it an appealing, cost-effective upgrade for upgrading lab-scale clusters with an existing QDR switch and some free ports. I happen to have access to systems with both FDR and QDR HCAs, so I put them to the test. To get closest to the theoretical performance, I first ran some of the benchmarks included in OFED's perftest. As we would hope, FDR does show considerably higher RDMA-write bandwidth at the IB layer. 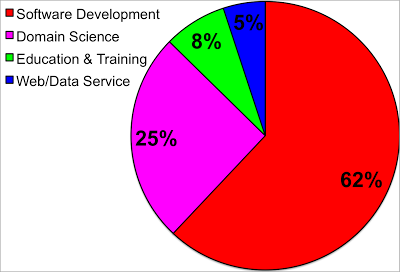 Of note is how rocky the FDR data is; each data point was an average over 5,000 write operations, so this noise is really present in either the systems or the interconnect. At this point I should say that the FDR system and the QDR systems are not configured identically, but they are both production machines tuned for performance. While the bandwidth for FDR is superior, what about the latency? 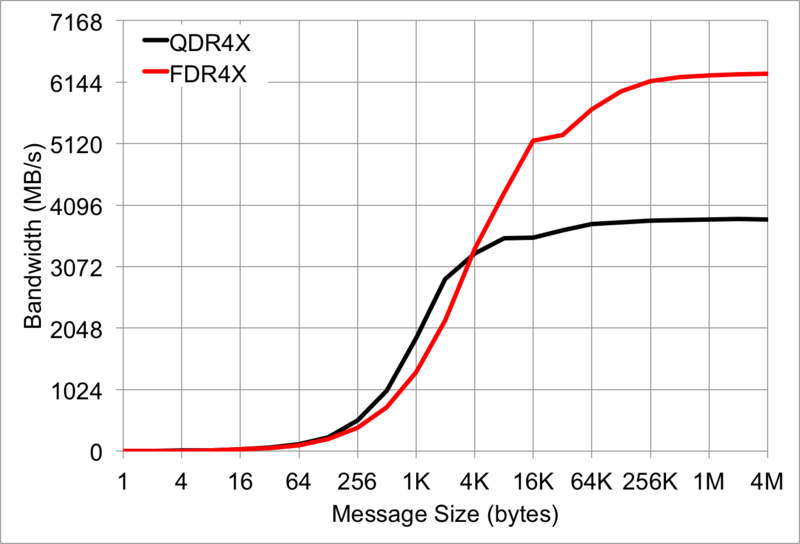 Perhaps surprisingly, small message sizes show more latency in FDR. Only when message sizes get sufficiently big to move into the bandwidth-bound regime does FDR outperform QDR. 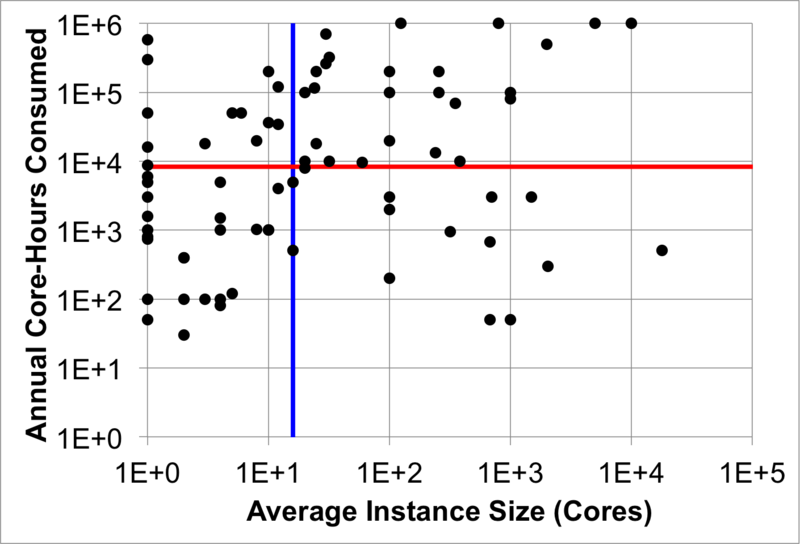 Unfortunately, latency-bound applications, which pass a large number of these small messages by definition, occur throughout the domain sciences, so this is cause for some concern. Of course, we could argue that measuring performance at the IB level requires significant extrapolation to predict the performance of actual MPI applications. High-performance MPI stacks like mvapich do a lot of inventive things to squeeze the most performance out of the interconnect, and the astute reader will notice that some of the MPI-level performance numbers below are actually better than the IB-level numbers due to this. 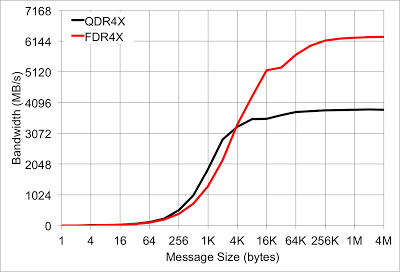 FDR has a higher latency (~1.67 µs) than QDR (1.27 µs) within the latency-bound domain. 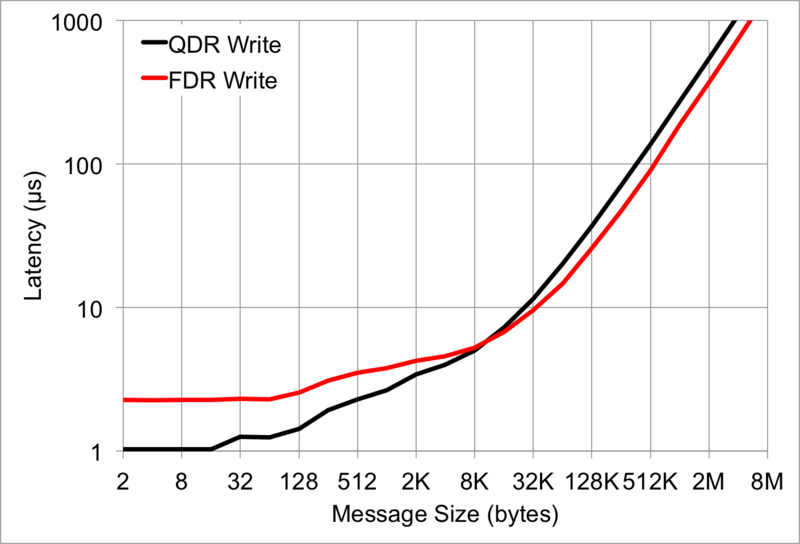 It would appear that FDR only pays off for messages larger than 12K, which happens to be the communication buffer size in both of the Mellanox HCAs used here. 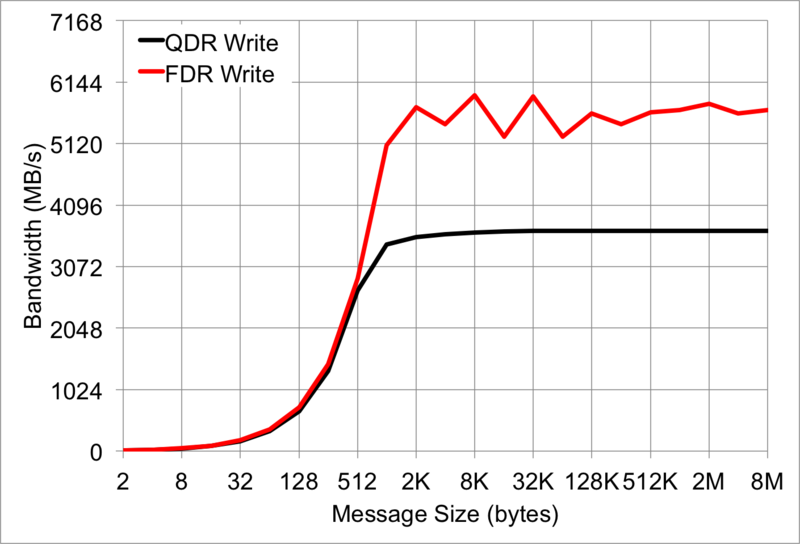 This got me thinking--if QDR only underperforms when the application becomes bandwidth-bound, is there a way to get effectively more bandwidth out of a QDR fabric? And if so, is it then possible to get the best of both worlds and have QDR's latency but FDR's bandwidth? Of these two options, I've heard several colleagues postulate #2 as a potential alternative to FDR and, as such, it was the more intriguing case to test. 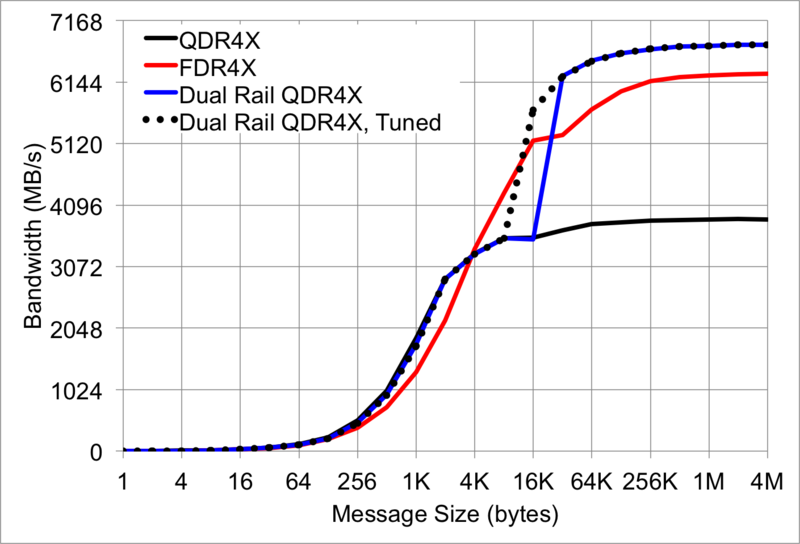 Very little information exists about dual-rail QDR interconnects, and since I happen to have access to one, I thought I'd give it a shot. Based on this data alone, dual-rail QDR seems like a viable alternative to FDR when it comes to getting more bandwidth for large messages. 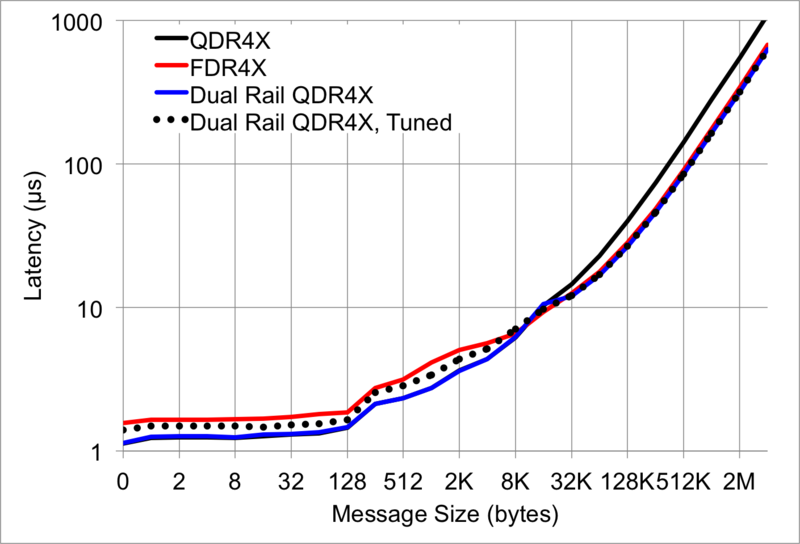 The approach looks a bit brutish though, as striping over the second QDR rail is only enabled for messages larger than 16K. This leaves an awkward window between 4K and 32K where FDR outstrips this dual-rail QDR setup. 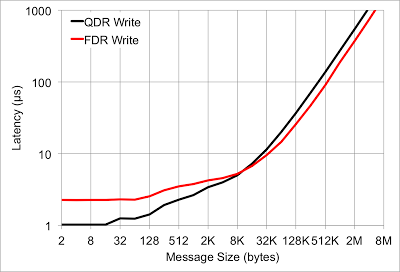 For reference, 32K corresponds to a 4096-element double-precision vector, which is not an unreasonably large message size. On the latency side, this approach does a fantastic job of maintaining QDR's lower latency for small messages (the QDR and Dual-QDR lines overlap for messages < 8K above). 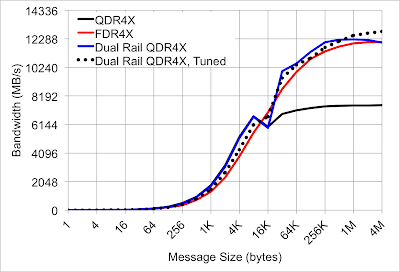 Latency drops once the striping switches on, but it is still no worse than FDR's latency, and the demonstrated bandwidth is actually higher than FDR. So far it looks like dual-rail QDR achieves the low latency for small messages and big bandwidth for big messages that we set out for, and the main side effect is that awkward cusp in the middle ground. Can we do better? One of the great features (or terrible complexities, depending on how you view it) of mvapich is the amount of knobs we can turn to affect runtime performance. With that implicit understanding, I figured the magical cutoff where messages start getting striped across both rails was one such parameter, and I was right. The increase in available bandwidth immediately prior to the cusp is due to the single QDR 4X rail saturating immediately before the second rail becomes active. Since the threshold for striping cannot go lower than 8K, I looked for other options to use the second rail. Still, our low-end latency remains lower than FDR yet we surpass the bandwidth limits of FDR at large messages. So what's the catch? 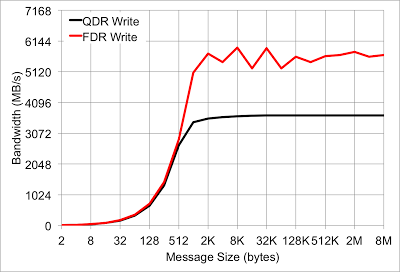 The bidirectional bandwidth in QDR suffers right around the area where the messaging protocol switches from eager to rendezvous at 12K. Alternating messages over both rails does mitigate this effect, but as with above, it does introduce additional latency which adversely affects the maximum bandwidth available to MPI. While FDR provides an evolutionary step in the bandwidth available to MPI from the IB layer, it is not the unambiguous best choice for application performance. Despite being four years old now, QDR Infiniband has not entirely been blown out of the water by FDR, and dual-rail QDR has the hallmarks of an alternative to FDR in terms of both latency and bandwidth profiles. While direct cost comparisons are difficult to make on account of vendor pricing structures, FDR is not really all that and a bag of chips. A good MPI stack and a little tuning makes dual-rail QDR quite competitive. This also presents a promising way to breathe extra life into a lab-scale cluster with empty ports on its Infiniband switch. The cost of adding new QDR HCAs is not huge, so a smaller cluster with empty ports can be inexpensively "upgraded" to FDR-like performance without having to invest in a completely new switch. As a final note, you will need an MPI stack that supports multi-rail Infiniband. 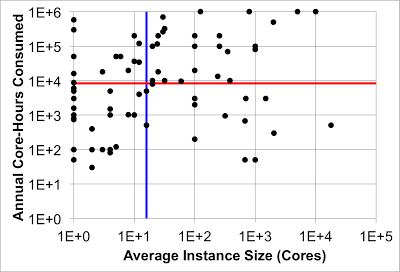 mvapich and OpenMPI both support it, but OpenMPI's implementation seems to be focused on fault tolerance over performance, and it shows much more variable performance.